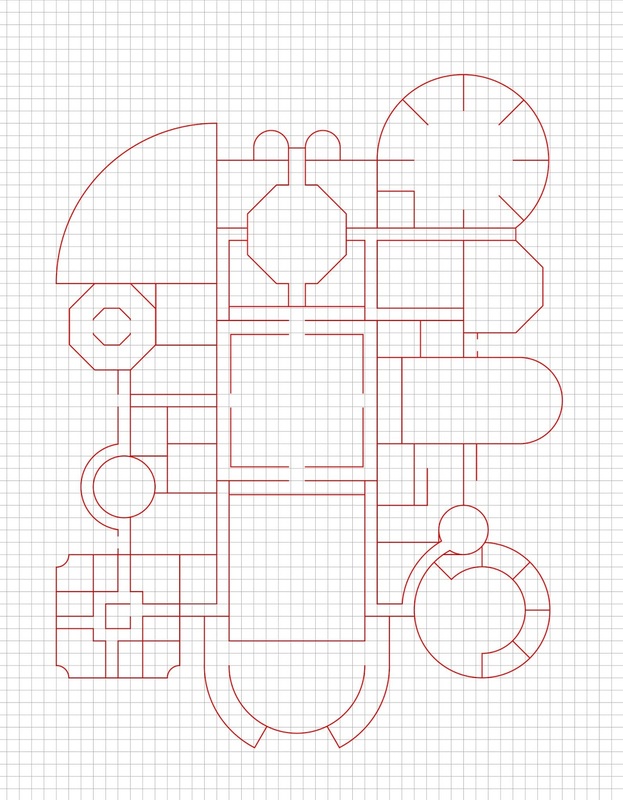 It's been a while now since I started drafting floor plans and skyship deck maps for Calidar. Looking back several years, I shudder at my earlier efforts, but then everyone has to start somewhere and learn the tools of the trade, right? 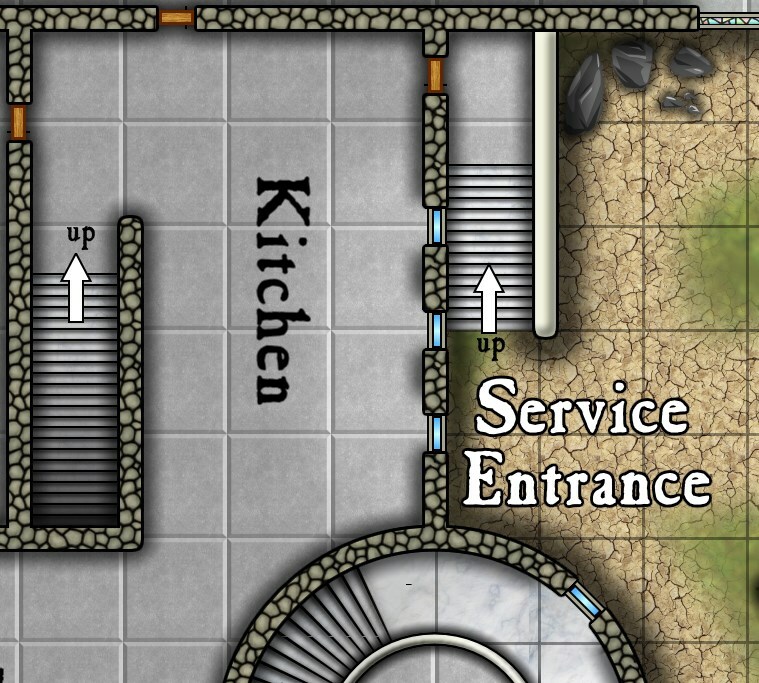 Though I wouldn't compare my work to truly professional endeavors, I'm going to show some of the steps I go through to create floor plans these days. Hopefully, this might give some ideas on how to proceed, or spark a discussion from which I might learn new useful bits. People have been asking me what software I use. Though the answer seems easy, it is misleading. I use Paint.net, a freeware application that's been growing over the past several years. I gave up on Photoshop way back after being overwhelmed by its complexity. Since then, I got used to Paint.Net and remain leery of the learning curve to switch to Photoshop or anything else. 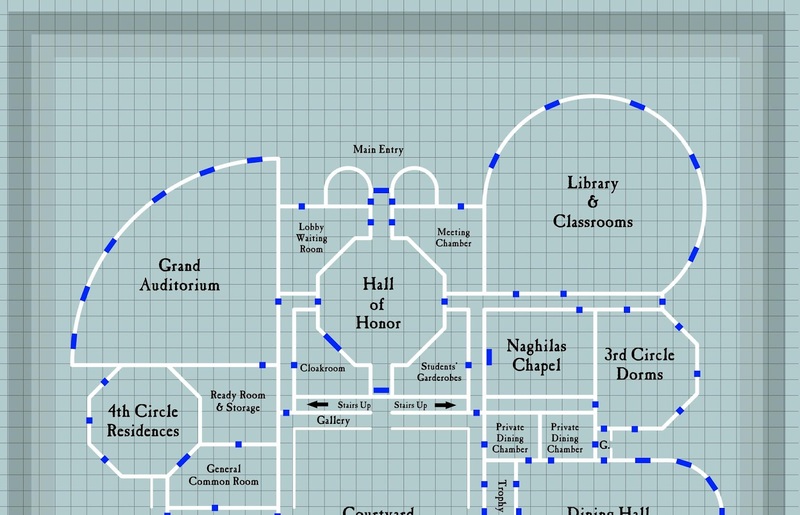 There are specialized "dungeon" mapping programs out there. I found them either too limited or in some cases unmanageable. I know people out there will disagree with me on this, but that's just my opinion. That being said, the answer above hardly covers the subject. 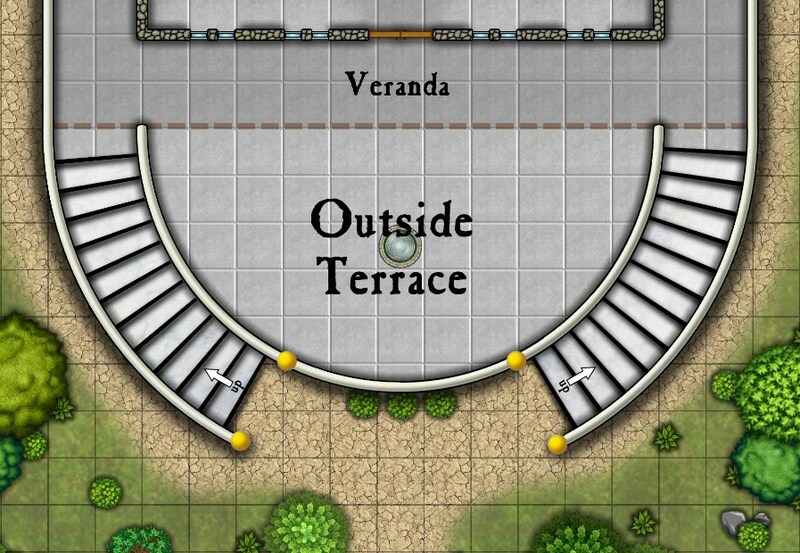 In order to draft the sort of floor plans I've been coming up with lately, there are two other key components: years of hands-on user experience, plus lots of stock art and background textures purchased from specialized sites. I rely mostly on Dreamstime as a source of illos and graphic textures. Costwise, over the years, this does add up. Another factor is the amount of time needed to draft a snazzy map. 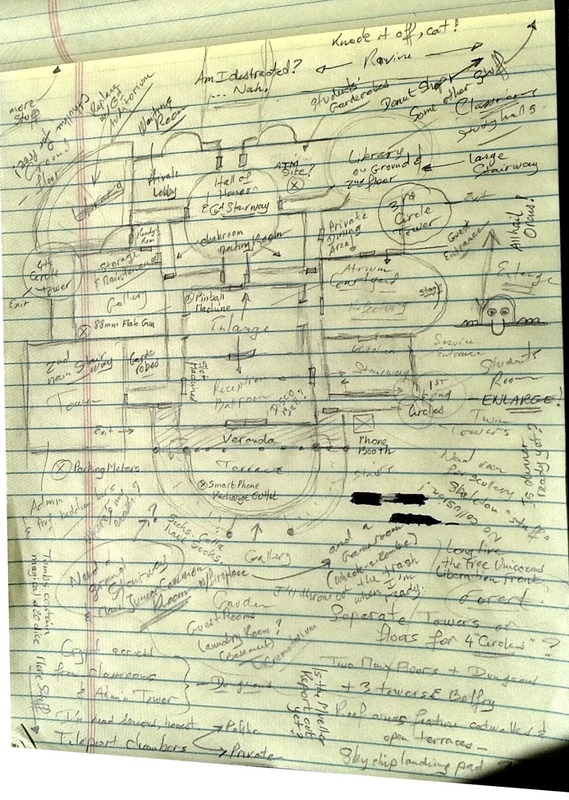 The one I'll talk about in this article took me about 3 days (more than full time), from concept doodles to final corrections, and this does not include "stocking the dungeon" (adding furniture and other details aside from doors and windows). 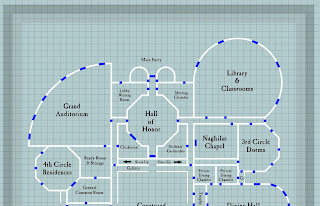 From a technical aspect, the final document includes 20-30 layers showing the various elements of the map. I usually work at 300 or 600 dpi resolution. Oh yes, and a fast computer with lots of memory will also help prevent long waits for every step of the way. The first step is the concept work. 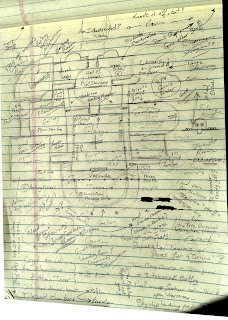 Basically, grab a sheet of paper and sketch out a very rough layout. As you can see on the adjacent shot, lots of things cross my mind as I throw in various shapes, erase others, and append new details. One generally leads to another, and pretty soon, space on that sheet comes at a premium. Of course, I could think of lots of things to include. Just to make sure I wasn't missing anything important, I turned to social media and probed the friendly hive mind there for other ideas. And, whoa... I got lots more. So, thank you everyone for your help. I promptly turned around and made a complete list of what had come up on social media, and split all these entries according to which floor each should be located on. That's just so I don't forget anything, since the entire project is likely to take weeks, from the dungeon level to the tippity-top of the highest tower. Occasionally and well after the brain-storming has effectively ended, someone surreptitiously adds an idea I can't possibly resist including somewhere, somehow... Click on the adjacent shot to get a closer look. Now the "real" work begins. I find it easier to draw simple lines to render the general ideas depicted on the hand-drawn sketch. Many corrections and redesigns occur at this stage. (You can trust me when I say there will be many more, kicking yourself repeatedly for not having foreseen them earlier; those will require a lot more work). That's already five layers--from front to back: 1. page frame which isn't shown here, 2. labels, 3. outlines, 4. grid, 5. white background. 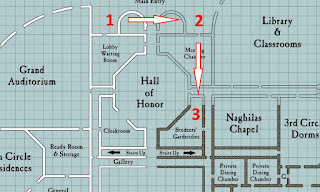 The page frame is to make sure nothing sticks out in the margins which may be chopped off during printing; this won't matter if you are designing a map for yourself. That's when you realize everything needs to be recentered, including the grid, something that you complete very, very carefully, right down to the single pixel, as an error at this stage will be tough and time consuming to fix later. Patience is a virtue here. Simple lines may be okay for your personal use. For something a bit more involved, the lines need to be turned into something that actually looks like walls. For this, the original line art needs to be thickened. Depending on the application, this may be a trivial issue. On Paint.Net, this entails adding extra outlines to the original drawing, which takes just a few seconds. 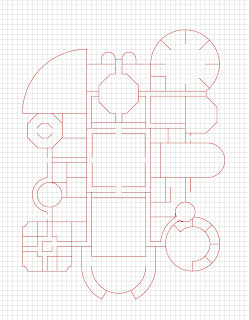 The game plan is to eventually add a black edge around the white outline, but before this can be done correctly, the walls need spaces added for doors and windows. The easiest way I found to make sure these spaces are all exactly the same sizes involves a temporary layer on which I cut/paste blue blocks. Once done, it's easy to select all the blue elements, move down to the white outlines layer, and hit delete. Once done, remove the layer with the blue blocks, since it's of no further use. Then add the black edges to the white outlines (1). I'm assuming most graphic programs can switch off white, which leaves just the black lines (2). That's a useful trick, because now I can select the inside of the black lines, move down to a new layer (3), and paste/fill the selected space with a stone texture of some kind. And there you have it: walls that looks like walls. Many more steps will follow, such as adding windows, doors, and wall shadows (do the latter on a separate layer, because otherwise corrections at a later time will become problematic). Fancy tiles come next to cover the indoor floors, plus ground textures outside the buildings. With a bit of testing, resize the tiles so they match the original grid exactly. Move up the tiles layer "above" the grid, so as to mask it within indoors areas. The original grid can still be seen outside the building. I often hide the grid beneath trees. I like to erase wall shadows where windows are likely letting light in. A gray layer can be inserted above indoor areas to darken the rooms; then, erase the part of the gray layer in the general vicinity of these windows, which enhances the impression of light. Set the eraser at its maximum softness so the effect is barely perceptible. 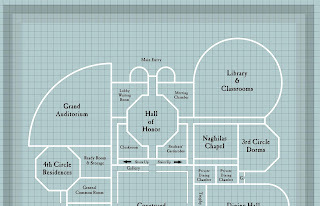 The result shows in this near final version of the floor plan (see just above). Stairs can be pretty snarly. The first challenge is to scale them correctly, assuming each step measures 7"-8" high -- therefore, figure approx. how many steps are needed to reach the next floor. The other problem is their width: on the map above, normal steps are intended to be about a foot across, and thus they look tiny (1 grid square = 10ft.) Yes, I can be OCD about this kind of detail. Each step in the stairs at the bottom of the map, by the open terrace, would therefore be several feet across, producing a very gentle rise. Compare with the stairways straddling the courtyard (rising at a 35- to 45-degree angle). In a modern house, stairs might require around 18 steps to reach the next floor -- in a palace, there could be twice as many, especially if the angle of the stairs is more gentle. There are various ways to represent stairs. Most folks will stylize them and not worry one bit about accuracy. After all, what's really needed in a game is just the information that "there be stairs here, up or down." I place an arrow showing which way is up. Being detail oriented, I also place shadows to help visualize the steps. It's actually pretty easy. I just recopy onto another layer the lines marking the edges of the stairs, shift them just a tad, and then blur these lines so they look like shadows; reducing the layer's opacity a bit can help here. A gradient darkening the bottom of the stairs is another useful tool. I guess I'm done rambling along. Hope you found something useful. Have a nice weekend! In my endeavor to write adventures for my present Calidar project, I came upon the task of putting together the plot for a party of juvenile sorcerers up to no good in the middle of the night in their college of necromancy. The assumption quickly became that each should naturally know a few spells taught specifically by their school: all of a necromantic nature, but of course. I didn't find a whole lot of spells fitting the bill in the various RPGs I looked up. I wanted a wide array of spells the referee could choose from. Seizing the undead monster by its unholy horns, I thus decided to add a bunch of new spells. The list below offers ideas for spells in the young heroes’ spellbooks. Though all necromantic, some of these spell may also qualify as other schools of magic. A roll of 1d4 plus any Intellect modifiers indicate how many of these spells each hero should possess. Roll 1d% on the list below or select these spells as needed, avoiding duplicate scores. Replace spells with similar ones already existing in the chosen RPG, if any. Note re. Caldwen's game mechanics: Being non-game specific, the language used below may cause some raised eyebrows. In most cases, the context will make the meaning rather obvious. Damage ratings go as follows: VL (for Very Low) relates to the sort of damage a dagger would inflict, Lo (for Low) relates to a short sword, M (for Medium) to a normal sword, Hi (for High) to a large weapon, and VH (for Very High) to an oversized weapon. Referees can assign appropriate damage in their chosen RPGs accordingly. LF stands for Life Force (a way of referring to experience levels or HD). More about this can be found in Calidar's Game Mechanics guidelines. 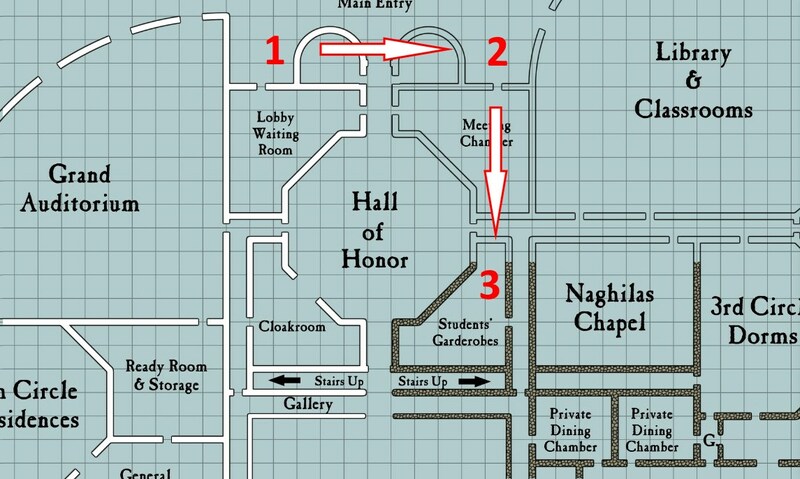 Circles of Magic refer to the general spellcasting abilities of students enrolled in colleges of magic (this will be defined in great detail in the gazetteer CAL2 "On Wings of Darkness" due for release this summer.) The First Circle concerns the least experienced spellcasters. The Fourth Circle accommodates the most experienced, to give you a rough idea. While looking into describing a character class in a manner usable with different RPGs, I ran into a challenge, as the scales each game system uses to measure experience are widely different. Calidar, which is meant to be system neutral, relies on a simple percentile scale to express the “Life Forces” of both monsters and characters. It is a tricky feature because this rating does not always convert accurately into all RPGs. There is a bit more to this than just how far up an experience progression table a character rises. The good news is that these experience increments aren’t that far apart. A more problematic challenge concerns exactly how many actual experience points each system involves. The rates at which experience is accrued in each game vary hugely at various points in the magic-users’ progression charts, especially as regards how quickly lowest levels can be attained vs. highest levels. 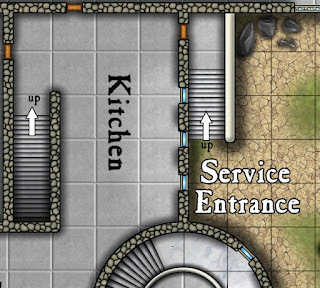 While the art is being generated for "On Wings of Darkness" and the core book undergoes text editing, I am finishing floor plan details. When the Kickstarter came up, last October, I'd left the sideview for the City of Arcanial's upper district in line art stage, without its color or texture. I finally completed this part yesterday. The wizards' capital city is a flying structure made of three levitating districts, one on top of the other and rotating in opposite directions. The ruling class along with the rich and famous live in the upper district (shown above). 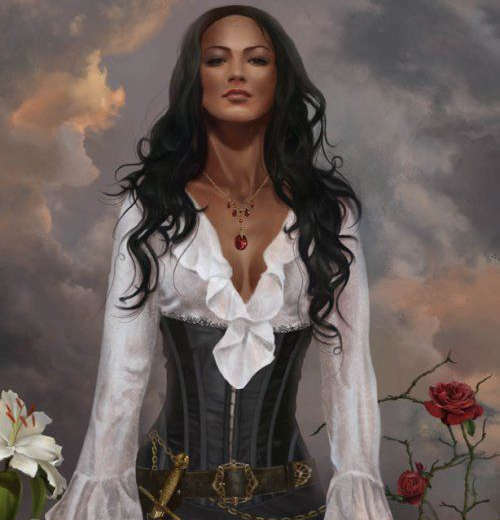 The upper middle class resides in the middle district, and the more modest lower middle class hails from the lower district (all things being relative, since Arcanial is an expensive place to live, compared with most other towns). 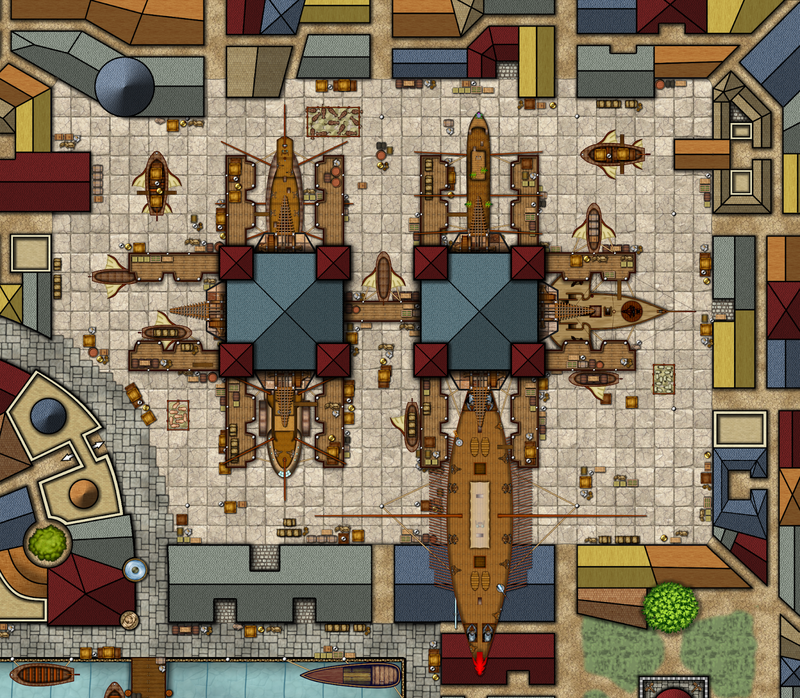 The lower class and those people on a waiting list to obtain living quarters aloft reside in the far less attractive Port Arcana, which lies on the ground surface, directly below Arcanial. A view of the skyport located on the ground close to the river harbor appears in my previous blog article. The upper district is tall enough for the main structure to house 14 floors, plus free-standing buildings on the terraces. 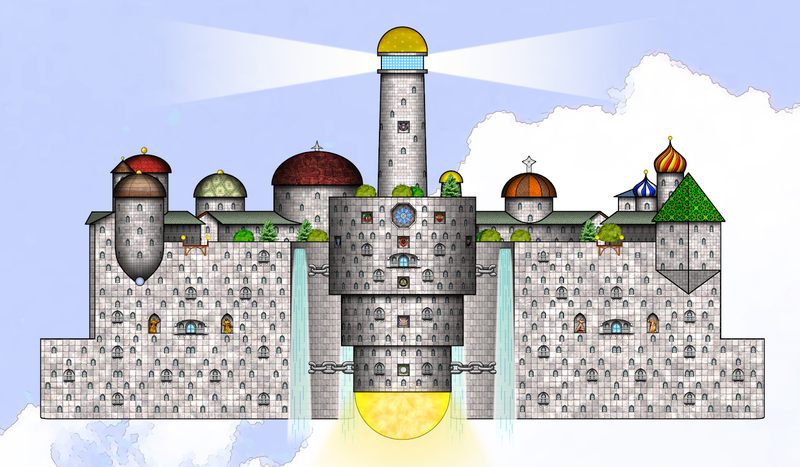 The lord high's palace is the cylindrical bit at the center, surmounted by a lighthouse. The bottom features a huge illusion of a sun (or a moon, depending on the time of the day.) Colossal chains anchor the upper district's various sections in place. The view above is a cross section, except for the palace, which I've not cut through. Internal ceilings are 9-10' high for most places. 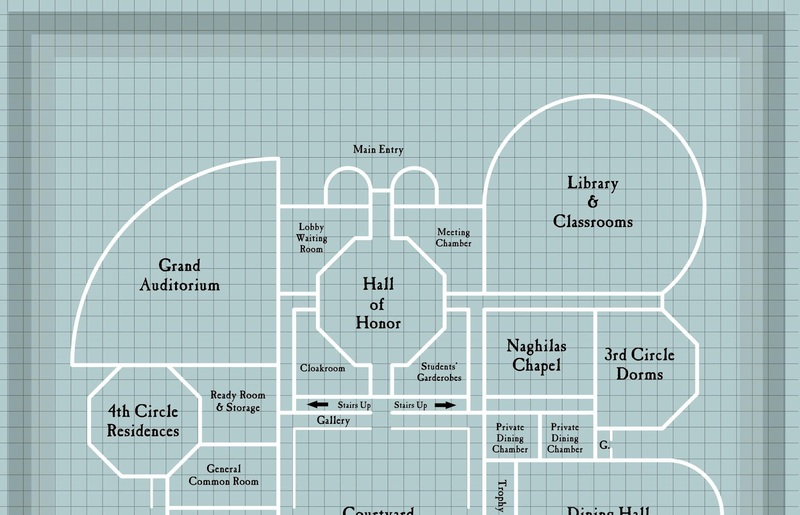 A short entry about each floor in the palace (matching the story at the beginning of the book), a general "street" diagram of the levels inside the surrounding sections, and the location of important features listed in the book give an idea of how the district is put together. Specific layout details are left to the referee (like any other fantasy city). Even more details on encounters, personalities, monsters, and specific locations follow in the book about the other two districts: plenty to start writing adventures! 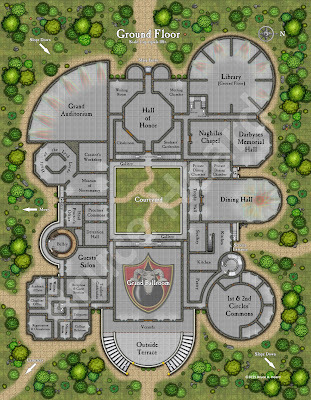 It took me long enough, but I did include a top view of Arcanial's skyport as part of the series of maps describing the magiocracy's capital city (On Wings of Darkness--available summer 2019). Essentially, it possesses two large "terminals" with multiple docking slots for skyships. In the view above, one very large vessel overshadows warehouses well below its hull. You might recognize the skyships from previous blog articles. 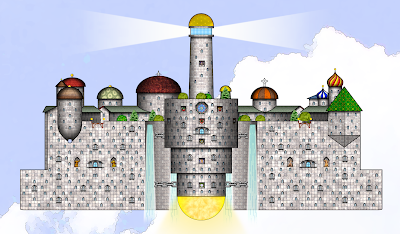 The skyport lies next to the river's northern embankment, some distance below the flying city. The terminals are huge towers with wooden "skybridges" that can pivot alongside docking vessels. 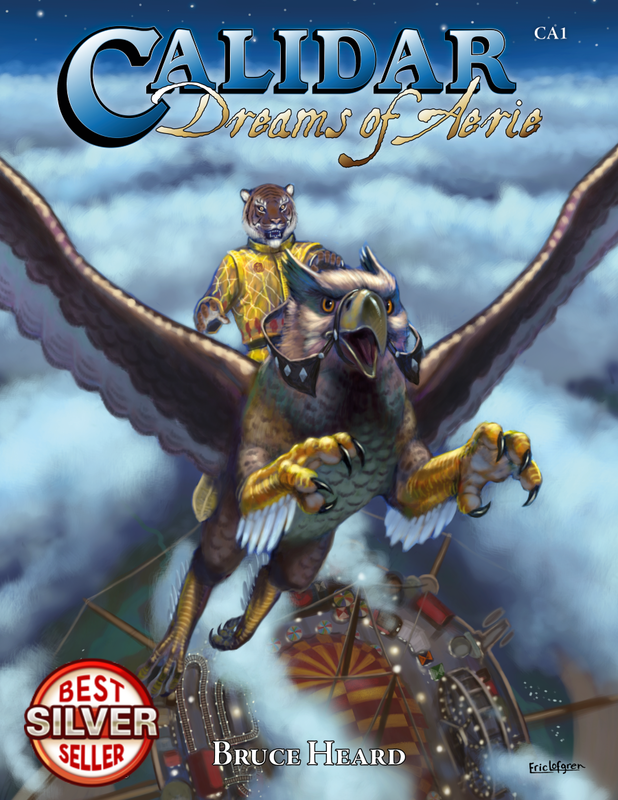 They rely on wheels and rails located inside the towers to keep them level, and load-bearing beams enchanted with reverse gravity spells to balance the devices. 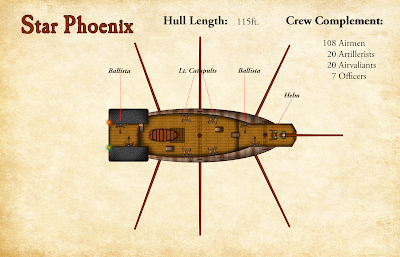 Skybridges are positioned high enough to leave sufficient clearance for masts beneath the skyships' hulls, and at different heights so pivoting docks do not interfere with adjacent ones. 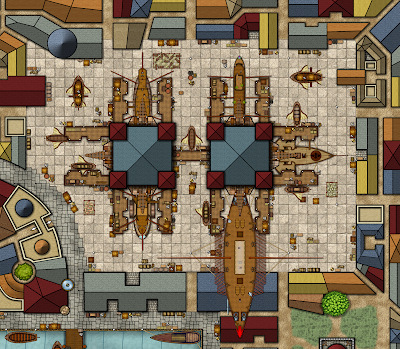 Docking presented a challenge since many of Calidar's skyships have outrigger masts angled above or below deck level. The towers' top levels house cranes handling the heaviest merchandise. The centers of the towers include a shaft with a hoist load down reaching to the ground level (or below if need be). Anything these mechanical devices and an army of fellfolk dockhands employed by the skysport cannot handle requires levitation spells, a common form of magic in a setting where many things dwell above ground. A swarm of flying barges headed to/from the city flying above pick up merchandise and passengers. Large vessels do not dock directly at the flying city for security reasons and because mooring facilities there aren't convenient enough. Any number of skyships otherwise remain tethered at air anchors, all around the flying city, well above the skyport. Much of the merchandise otherwise transits through warehouses surrounding the skyport. One might wonder what sort of security a facility of this nature demands. Air travel in Calidar's universe isn't comparable to modern day, real world commercial aviation. There's nothing like mass passenger transportation. Paying passengers are an exception more than a rule. Much of the traffic concerns valuable freight, especially in the case of Caldwen. For the sake of the ruling class's privacy, local control, and prevailing paranoia, few roads exist across the magiocracy. Transportation relies mostly on rivers and airways. Both are needed to feed the capital city. Wizards and the upper class in general own private skyships which they use for leisure, relying otherwise on spells and teleporters to travel. On the other end of the spectrum, the hoi polloi rarely venture far away from their birthplaces. Nonetheless, some seal-bearing documentation is often required when stepping aboard or disembarking a skyship in a major city. City guards and the port authority are generally in charge of security. City guards use their own flying barges to board and inspect approaching vessels before authorizing them to come any closer. Dockworkers act as eyes and ears for the captain of the port. Much of their focus remains on preventing merchandise theft and smuggling. Overseeing sorcerer's are responsible for collecting docking fees and the use of aerial mooring space near the capital city. Fees are paid to the port authority. Sorcerers also intervene when dockhands report something suspicious (for which the latter earn monetary rewards). Very much in the style of Caldwen, bound demons can be summoned to handle challenges to law enforcement. The port authority resorts to geas to help alleviate the problem of bribery among spellcasting inspectors and unscrupulous dockworkers, a daunting task considering the number of people involved. In a city where most things are expensive, theft and bribery aren't uncommon, not to mention potential sabotage risks from the Fifth Column, a secret society of activists demanding the return of Caldwen as a colony of the Nicarean Empire. This article is the third in the guild series. 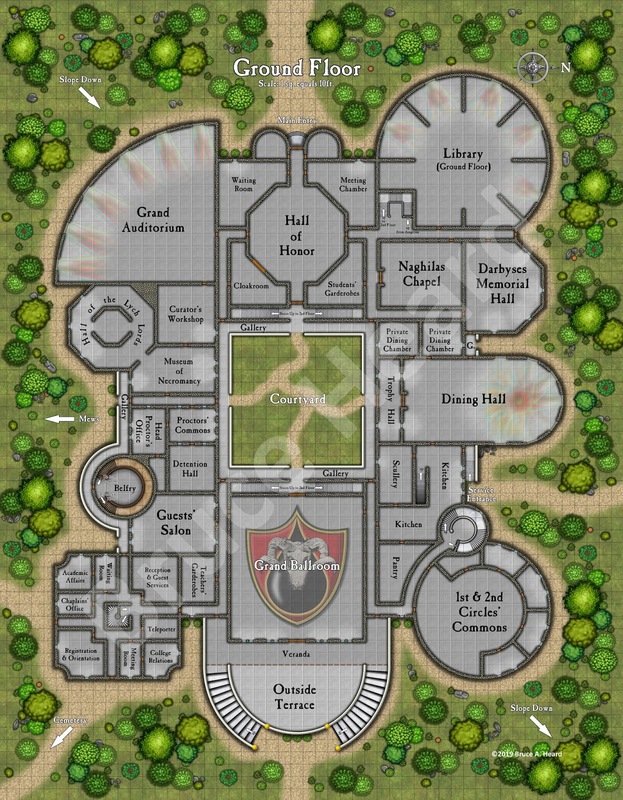 Click here to catch the first one, along with a word explaining how Caldwen's guilds are set up in general, and what academic diplomas are about. Dragons both fascinate and terrify. These ancient beasts attract insatiable curiosity from spellcasters wishing to unveil their secrets and own their powers. For some, there is the visceral desire to master such magnificent creatures, to learn from them, or perhaps to protect them. The trouble is that dragons are largely seen as evil monsters in Calidar’s universe. Most are. Rumors of a war between dragons seemed to imply evil ones killed their better kind, or perhaps merely drove them away. This field of study is a riven one, with as many quarrelsome cabals as the colors of dragons. They all teach the same tools of the trade, but with different intents. As a business, dracologists dispense care and knowledge of dragons, advising the military or the wiser mages, or ridding lands plagued by such creatures. Belledor & Phrydias: This guild aims its sympathies at hypothetical benevolent dragons. It seeks to prove their existence, to facilitate their return to this world, and to banish or fell evil ones if they do not yield to the common good. The guild in Seahollow focuses on gold dragons and seeks to clarify false assumptions about them. Surrounded with mystery, this guild is more powerful than it appears. Information has filtered in from Lao-Kwei during the past century about such wondrous beings. The guild recently set up a legation on that faraway world. 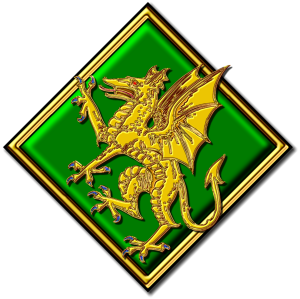 A third branch in Phrydias investigates new theories about metallic dragons other than gold. Exceedingly cautious about recruits, these cabals publicize neither their findings nor their members’ identities. A number of Meryath spellcasters have joined this guild. 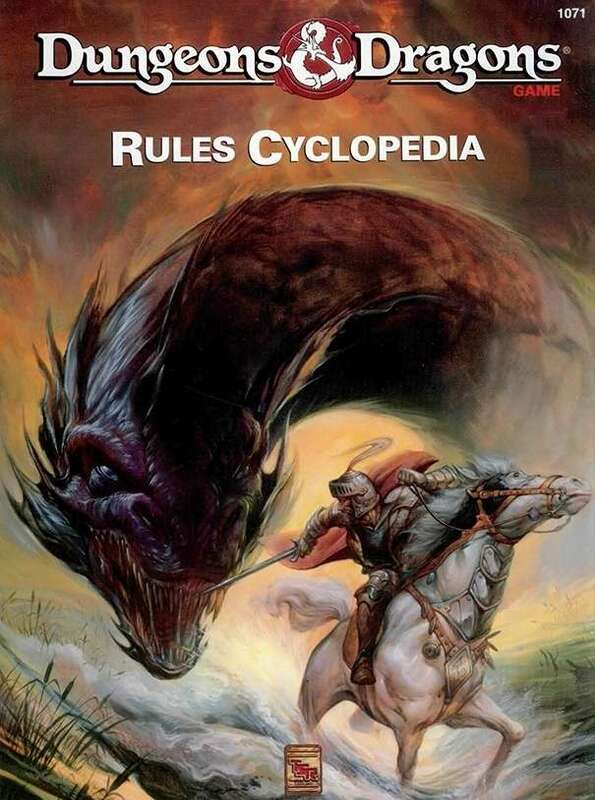 Caldwen & Nordheim: These dracologists abhor the arrogance and foolishness of slaying dragons. Regardless of ethos, they will protect them in any way they can. Their goals are to respect dragons, gain their trust, learn their secrets, and endeavor to cohabitate for the sake of peace. They keep quiet about their tacit willingness to serve dragons whom they see as the greater race. A main outfit, in Meggidon, focuses on black dragons. Another, in faraway Nordhavn, protects whites. Relatively obscure, other such cabals scattered in the Great Caldera, focus on various other breeds. Ellyrion & Alfdaín: Ever the military types, Ellyrian dracologists dream of commanding dragons for the sake of power. They see them as invaluable airborne cavalry. All dragons must be subdued or slain, and their eggs seized so hatchlings may be raised to serve the empire. An establishment, in Drakotiris, concerns blue dragons. A rival outfit, in Lathias, specializes in green dragons. There is nothing secret about these cabals as both actively recruit spellcasters. 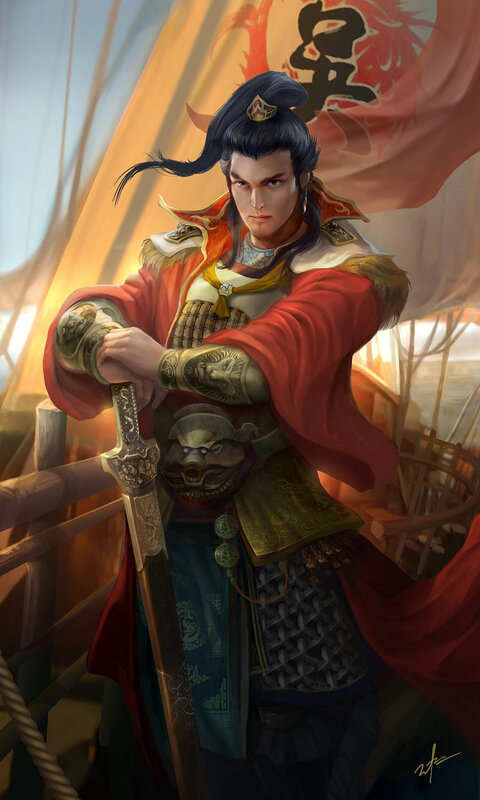 Demeanor is mostly martial. Primary strategic aims are to deny outer world powers access to Dread Lands’ seitha deposits. The chapter goes on to describe three inner cabals. 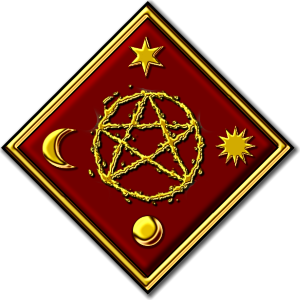 The Cabal of the Blood accommodates magic-users with Spellcraft Licenses in Invocation and Divination, teaching intuition and empathy between certain dragons and their cabal advocates. The Ritual of the Blood, if it succeeds, gives advocates useful skills to interact with their chosen dragon breeds. The next step, in the Cabal of the Fierce, enables qualified advocates to learn the ropes as thaumaturgists. If the Ritual of Invocation succeeds, it unlocks innate dragon-like powers. Some of you may recall a similar treatment in GAZ3 Principalities of Glantri, and you won't be disappointed. The last cycle, in the Cabal of the Wyrm, "surviving" members learn to master the Ritual of Dedication. If it succeeds, they must select one of several paths defining the nature of their relations with a specific dragon of great power: minion, protector, godfather of the present clutch, or slayer for the sake of Eternal Glory. Each of these cabals presents many dangers in one's quest for perfection, and failure results in dire consequences. Powers are nice, but getting them isn't easy or for the faint hearted. All cabals in Caldwen are similar in this respect. This article is the second in the guild series. Click here to catch the first one, along with a word explaining how Caldwen's guilds are set up in general, and what academic diplomas are about. The chapter goes on to describe three inner cabals. 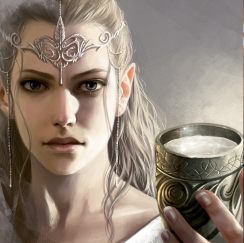 The Cabal of the Calling accommodates magic-users with Spellcraft Licenses in Illusion and Necromancy. It teaches how to identify specific demons and establish consensual bonds. Its members are called theurgists. The Ritual of Calling eventually establishes a permanent bond between a theurgist and a demon soul mate. The Cabal of the Flesh accommodates qualified theurgists with Bachelor's degrees. It teaches how to engender demonic creatures permanently bound to their creators through a Ritual of Sacrifice. Members are called progenitors. The Cabal of the Spirit accommodates accomplished progenitors with at least Master’s degrees. It is a fellowship of scholars seeking the secrets of True Names. There is no formal instruction related to this craft. Success is measured in the ability to affect archfiends without relying on pacts. Its members are called demonologists. They must choose one of three paths to complete their final quests: The Path of the Master, the Path of the Reformer, or the Path of the Servant, which determine the nature of the relationships between archfiends and demonologists. Each of these inner cabals provide special powers which come in exchange for personal sacrifices. If the above piqued your interest, you can still get in on the project, have your name listed in the Gazetteer's honor roll, and receive a copy. The related Kickstarter's rewards are still available to anyone who missed last October's crowdfunding; this offer ends after December 31 2018. The core reward's fulfillment is expected in July 2019. Click on the banner above to check what the original Kickstarter offered, and get in touch with the author for further instructions if this is for you. Thanks! Just 'cuz I have a beef with Marcus Cinema, I'm posting this here too. "I had the opportunity to watch a movie with a friend a few days ago, at Marcus Cinema in Waukesha, WI. We got there and were told the showing had been cancelled 5mn earlier to make room for a private viewing of some other movie for the benefit of the local press. I wasn't amused. So, we had to settle for another showing, not in the large Ultra Screen auditorium but in a much smaller one, an hour later. "First off, I was really disappointed about my friend not being able to experience the large auditorium with big leather reclining seats. He was traveling from Europe and hadn't tried something like this as of yet. Gee thanks. "Second, we ended up in a smaller venue, whose seats were supposed to be the comfortable, reclining sort. Unlike those in the Ultra Screen room, I found them awfully uncomfortable. Maybe it's just me, but the seating results in a cupped position, which is okay for about 20mn, after which I need to sit up and straighten my back. The trouble is that in the upright position, the top of the seat pushes back against the back of the head to the point of giving a headache. So I spent the duration of the movie, leaning to the side, resting on an elbow, trying to find a comfortable seating posture. Terrible. Won't go there again. "I've come to the realization that I'm much happier watching movies at home. It's cheaper and more convenient. 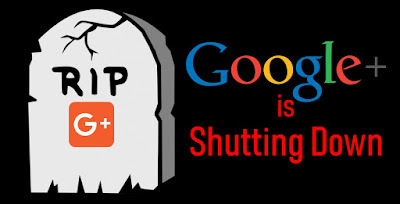 Cancelling a showing at the last minute just broke the camel's back as far as I'm concerned." While work on the new Gazetteer progresses, I'd like to take the opportunity to post a series of previews on Caldwen's cabals. The grand magiocracy does not have a single general-purpose “guild of sorcerers.” Instead, there are so-called “cabalist guilds,” private associations concerning specific types of wizardry. The magiocracy's legislative branch, the Upper Chamber of the Magi, provided the official charters defining the cabals’ spheres of interest and giving them legal power to regulate their craft. 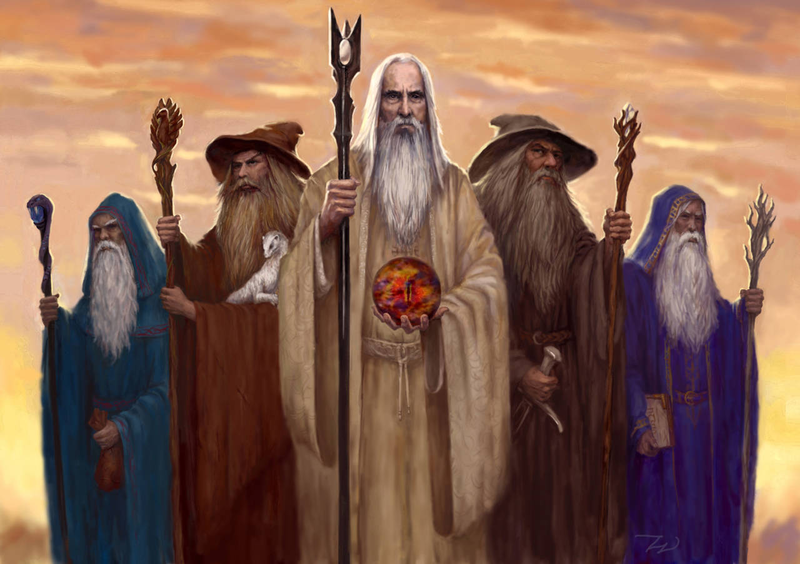 Six well-known cabals exist in Caldwen, each one focusing on two spellcasting philosophies nearly exclusively and on the special powers of their craft. Similar guilds in different realms, if any, are most likely connected with Caldwen’s. 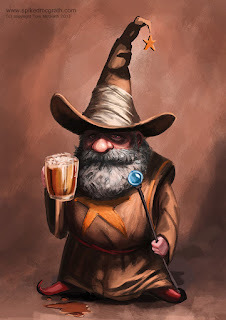 Spellcasters holding Masters* or PHDs in philosophies other than those associated with cabalists lack the necessary train of thought to embrace guild craft. On the other hand, cabalists can only progress past Bachelor degrees within the two philosophies of their craft. Ironically, archmages are unable by definition to become cabalists, as Grand Wizardry demands mastery in all spellcasting disciplines. (*) Caldwen's mages earn "official" diplomas from the various schools of magic, including such things as Spellcract Licenses, Bachelors in the Arts, Masters in the Arts, and Doctorates in Philosophy. These diplomas are relevant to social status and legal rights in the magiocracy. They also reflect one's degree of competency in the arts. 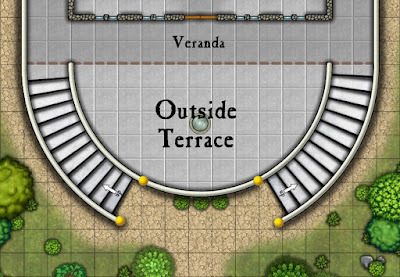 This section of the Gazetteer continues on to describe three related cabals: Apothecaries, Alchemists, and Philosophers, which members can join as they learn their craft and perfect their skills. This includes qualifying tests, ordeals, personal sacrifices, special powers, and tools of the trade. 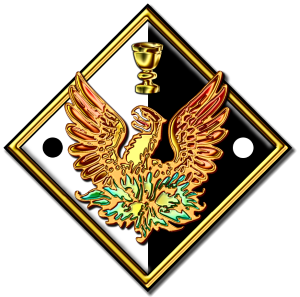 To master the last cabal, a philosopher must engender three wondrous objects known as the Raven, the Swan, and the Phoenix, reaching the final goal of the quest: the Magnum Opus, otherwise known as the Philosopher's Stone. Missed your chance to get in on the fun? No problem: PM me to make a private pledge, upgrade your contribution, or grab those few more add-ons you overlooked or could not afford at the time. Though the Kickstarter is now over, there still is a window of opportunity to get exactly what you wanted. 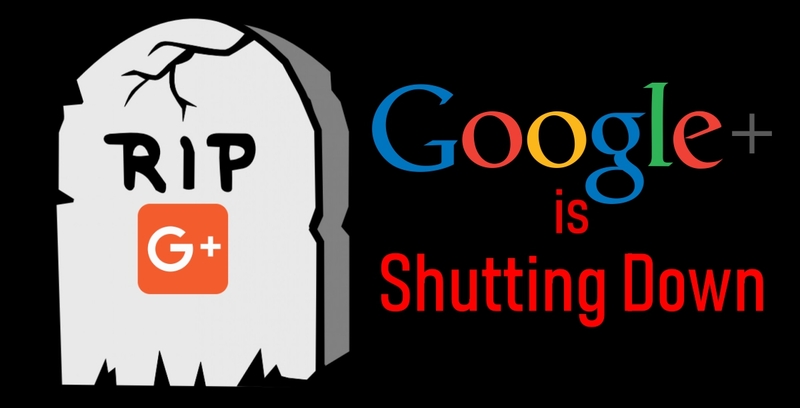 You can reach me on Facebook, G+, MeWe, and Kickstarter. Click here to see what the original project offered.